SMi Report: An exclusive interview with Dr Alexander Stoll, Vice President, Head of Competence Center Microbiology and Aseptic Techniques, Fresenius Kabi speaker at this year’s 8th Annual Pharmaceutical Microbiology UK Conference is now available to download on the event website. In the lead up to the 8th annual Pharmaceutical Microbiology UK Conference taking place in London on 21 and 22 January 2019, SMi organised a speaker interview with our speaker Dr. Alexander Stoll, Vice President, Head of Competence Center Microbiology and Aseptic Techniques, Fresenius Kabi, to discuss the current landscape of pharmaceutical microbiology. Dr Stoll will be speaking on day one of the conference with her presentation entitled ‘Case Study on using contamination recovery rates to measure performance and improve contamination control’. Dr. Alexander Stoll completed his PhD thesis in Microbiology/Genetics during September 2001 at the University of Kaiserslautern. After moving to Sweden, he started working in December 2001 for Fresenius Kabi sterile international manufacturing plant in Uppsala, leading a group of microbiologists responsible for microbiological qualification of sterilization processes. In his current position as Vice President Competence Center Microbiology & Aseptic Technique he has built a group of subject matter experts working with all pharmaceutical Fresenius Kabi manufacturing sites and compounding centers, setting global standards. Throughout the years he has gained intensive hands-on experience from different sterile manufacturing techniques for finished medicinal product & API and multiple international authority inspections. How would you describe the current challenges in the pharmaceutical microbiology field?Throughout the last years for sure data integrity has been one of the focus areas for pharmaceutical microbiology. Main focus so far has been how to control & safeguard many of the still manual microbiological processes but also how to better automate some of those processes. I think we are still at an early stage of the automation we have seen in this area so far and I am convinced that automation in the microbiological laboratory will remain a challenge for many years to come. What developments within contamination control have really caught your eye in the past year? Especially when it comes to aseptic manufacture of pharmaceuticals there have been many developments into better isolator technologies and more efficient automated decontamination techniques. For the full exclusive interview with Dr Alexander Stoll, visit the download centre of the event website. Other topics that will be addressed throughout the programme include: contamination and endotoxins, environmental monitoring, new mechanisms of detection, risk assessments, the current challenge of biofilms, mold contamination challenges, rapid microbial methods and so much more. Running alongside the conference are two post conference workshops taking place on Wednesday 23rd January 2019, hosted by Microrite and Batelle Memorial Institute and STERIS Corporation. 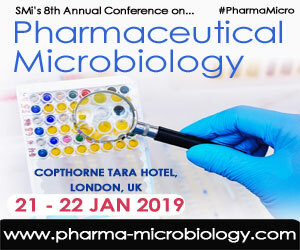 If you are interested in participating and attending the conference, you can register at www.pharma-microbiology.com/PR2 and save £200.